Secretaries have a pivotal role to play in a company. They have administrative as well as coordinative duties to perform. These professionals assist the head of institutions and enterprises with agility and expertise. 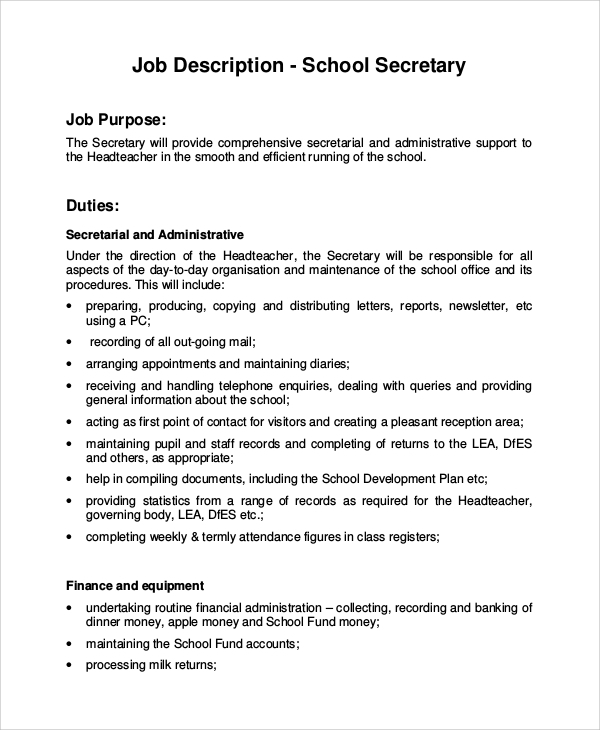 If you look out for Secretary Job Description, you need to choose a particular category. From business firms to educational institutions, there are different profiles for the secretaries. You can scroll down and find the Sample Job Description of secretaries of various types of institutions. Legal secretaries have to deal with some responsibilities like the formatting of legal documents, screening incoming calls, arranging for conference calls and so on. The job description is presented below the company profile. This particular profile has a different requirement, after all. The job description includes educational qualifications, experience, internal and external contact responsibility, certain physical requirements and compatibility to work conditions. You can also see the CEO Job Description Samples. 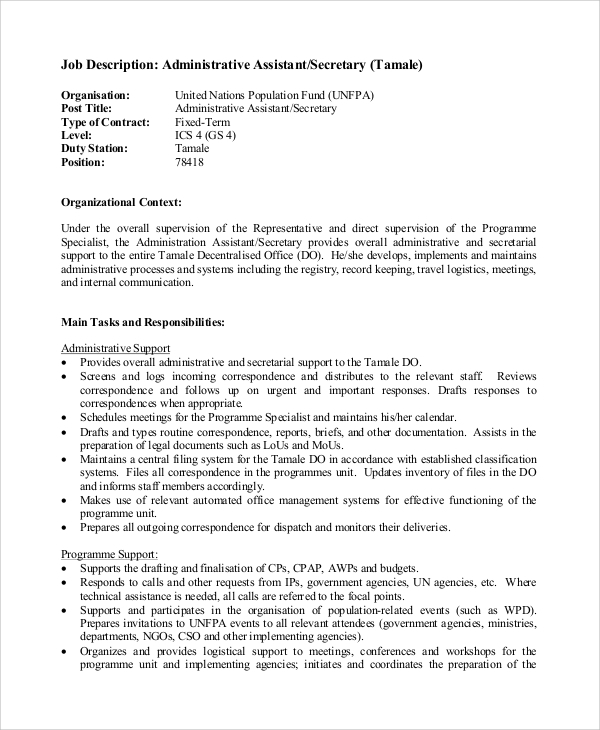 Job descriptions for administrative secretary posts include detailed information about the tasks and responsibilities of the candidate. These also include people management responsibilities and program support duties. A school secretary has to analyze the financial information, deal with computer based finance management processes and shoulder child protection duties. 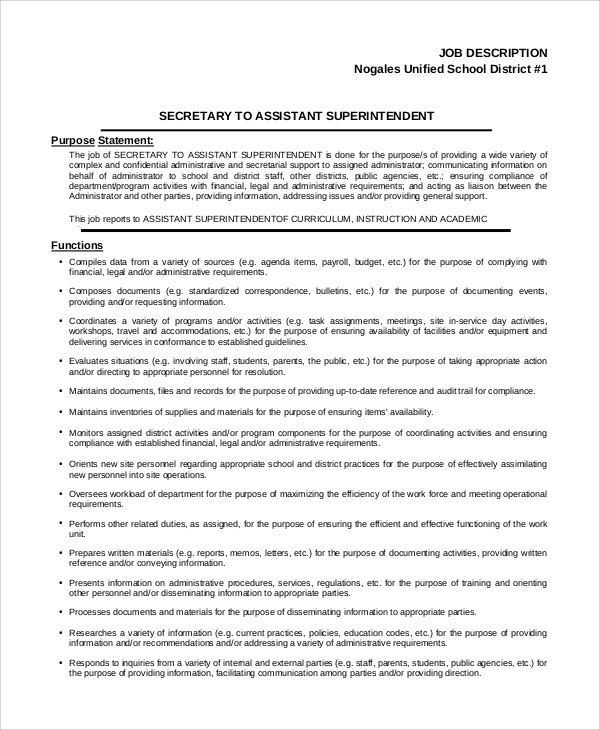 There are several other administrative responsibilities on school secretaries. 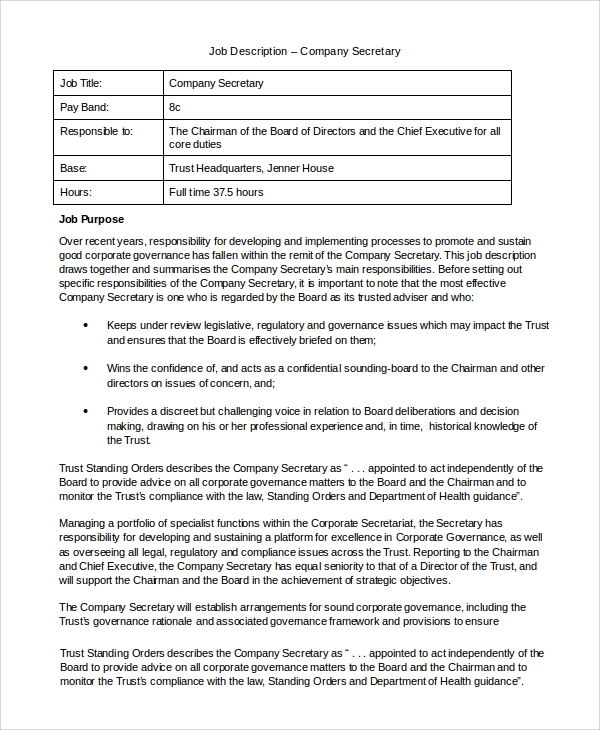 The duties of a company secretary Job Description include reviewing the legislative and administrative duties. He/she has to win the confidence of the chairman of the company through his/her performance. He/she arranges for a sound corporate governance in the company’s administrative infrastructure. 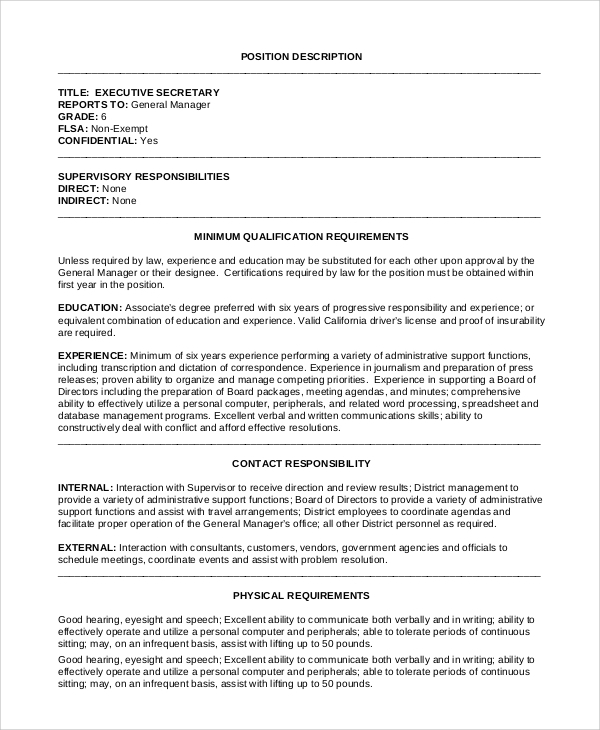 What is the Purpose of a Secretary Job Description? The Job Description Samples are required by companies who are looking out for strong candidates for a particular post. A secretary has to perform some functions and hence, the company has to lay out the entire set of responsibilities. When a company posts on online platforms for vacancies, it has to specify the exact duty of the profile. Moreover, there is a considerable degree of variation in the responsibilities of secretaries. It is important to include the specific responsibilities in details so that there is no lack of interpretation in future. The recruiters will be free from the hassles of dealing with unsuitable applicants. 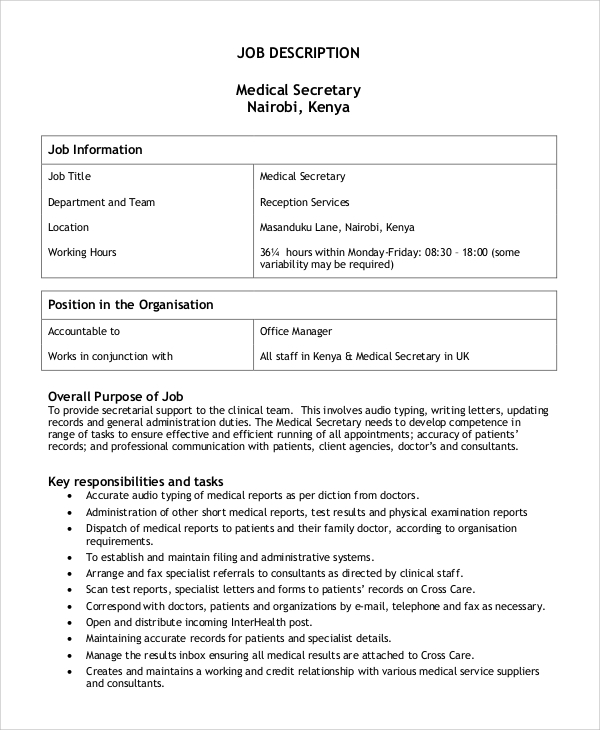 What Information Does a Secretary Job Description Contain? 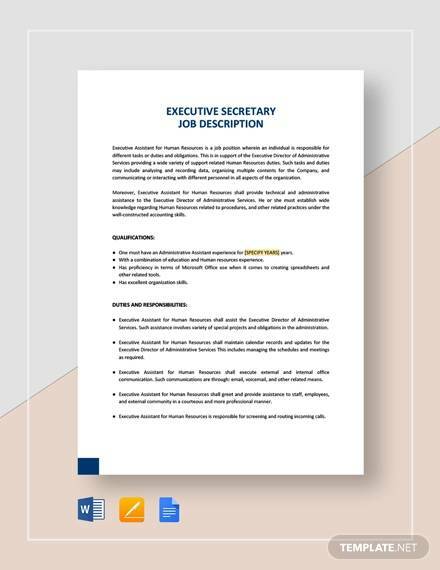 A secretary job description consists of relevant information about the personality and duties of a candidate. As they play a vital role in the smooth running of the company’s administration, they need to have excellent employee management capabilities. You can also see the Medical Assistant Job Description Samples. These features are included in the description. Apart from this, relevant information is provided on coordination responsibilities. The secretary acts as an interface between several platforms like customers, investors, the company itself and other vendors. 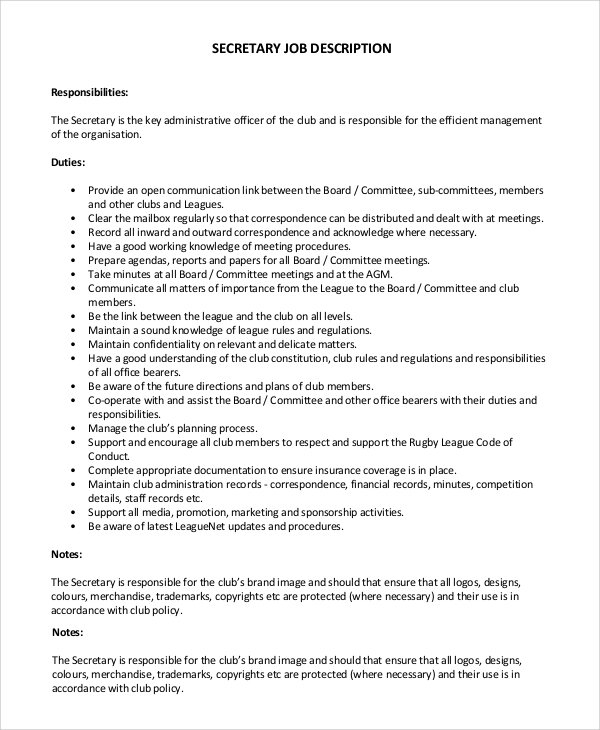 So, the companies have to specify these duties for mutual benefit. Each of the professions is unique regarding responsibilities and duties. So, companies require different types of job descriptions to recruit potential employees. 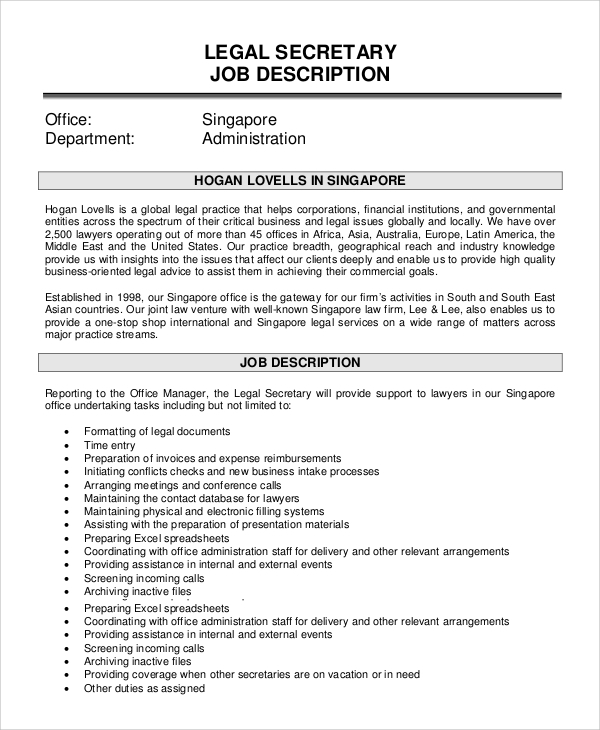 You may look out for various job descriptions like the Receptionist Job Description Samples, secretary for law firms and other profiles in the portal. You will find accurate details of all the profiles.